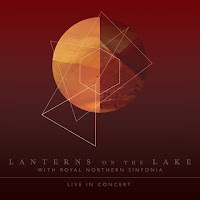 Back in February, Lanterns On The Lake collaborated with the Royal Northern Sinfonia for a one-off show at The Sage in Gateshead. Bella Union have just released a digital version of ten of the songs from one of our favourite shows of the year and it's every little bit as special as we remembered. Lanterns On The Lake are one of the country's most underrated and underappreciated bands. Three albums in (Gracious Tide Take Me Home, Until The Colours Run and Beings) and they've garnered serious critical acclaim without making a huge commercial breakthrough. Live With Royal Northern Sinfonia affords them the space to revisit songs, predominantly from Beings as eight of the ten tracks on this album come from that with one each off the first two. The performance was arranged and conducted by celebrated composer and violinist Fiona Brice and was an unqualified success. Brice's arrangements are all about space, the songs are given room to breathe, moments where it's just Hazel's piano and voice and then the orchestra come in slowly building to a dramatic peak as on the opening track Of Dust And Matter before dropping down and letting Hazel finish the song. At others, the orchestra lead the way to stunning effect such as Faultlines that follows, revealing new layers and depths to the songs as they go. And that's a theme that runs through the whole of the show. Where orchestral performances can tend to lead to everything been thrown at songs, the magic in this record is that the opposite is true. Throughout songs are given room to breathe, to stretch themselves out and blossom. I'll Stall Them is given dramatic effect as the strings build, the brass crashes in and Hazel's voice sits dead centre, every syllable perfectly emphasized. Send Me Home starts with her alone on piano, each note so ice clear that it sends shivers up the spine. It's not easy listening, because there's such detail in here, but, like Elbow's Seldom Seem Kid reinterpretation with the BBC, it's so intoxicating and all-encompassing that it holds you in a spell from the moment you hit play. The Crawl has a haunting romantic feel to it, the brass used for emphasis as the strings dance away below Hazel's stunning vocals which are so rich in emotion that you can almost see it pouring out of the speakers. Stepping Down uses the orchestral instrumentation to claustrophobic effect, starting with heavy drums that come back in at various points throughout and strings to heighten or lighten the mood, whilst the seven minutes plus of Beings swoops and soars effortlessly and gracefully to breathless effect. The show's encore makes up the last three songs of this set. Green And Gold is Hazel unaccompanied on piano. It feels so minimal, so on the edge yet so utterly gripping as she muses first that fear is just a fleeting thing and later that love isn't. It contrasts with Stuck For An Outline where the orchestra let loose towards the end as the band take a step back. The set concludes perfectly with I Love You Sleepyhead from their debut album, a song tailor-made for the lush strings that accompany it through its meandering soul-searching nine minute journey. Live With Royal Northern Sinfonia is a success on every level. Beautifully captured and mixed, it's a document of a collaboration that augments songs that are already meticulously constructed and emotionally charged. It's only available digitally at present, but it'd be a travesty for this not to get a physical release and recognition of its place as a truly exceptional work of art. Our review of the show can be found here.